An endearing travel guitar offering a completely different vibe from the big American-name options. Lots of fun. Tiny size is travel-friendly. Decent build. Excellent price. Saddle edge a little sharp. First things first: that name. 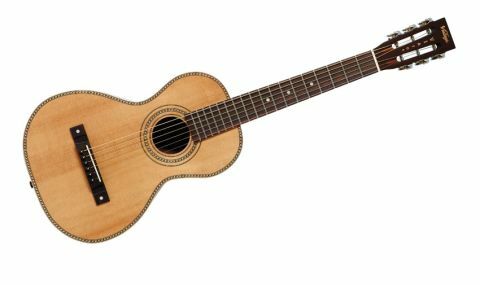 Vintage says that it's new acoustic's Viator moniker is derived from the Latin word for road [via] and, aptly enough in the case of this new model, means 'traveller' or 'voyager'. It's pronounced 'vy-ah-tor', just so you know, and is definitely not 'Violator'. Shall we move on? English folk/roots guitar player and historian Paul Brett began collaborating with the Vintage brand a year or three back, the results of which are his six- and 12-String models that both debuted in 2012, to very positive reaction (just read our Vintage Paul Brett VE8000PB-12 and Vintage Paul Brett Signature VE8000PB reviews). "Travel guitars have gained serious credibility of late: just ask Ed Sheeran and his pint-sized Martin"
Eschewing the 'modern' 14-fret American blueprint both tonally and aesthetically, the Brett signature instruments have more of an early 20th century vibe, inspired by the forebears to the all-pervasive dreadnoughts, 000s and jumbos that dominate today's market. This new model continues that general theme, but shrinks it all down to travel guitar dimensions. The timing is good for two reasons: firstly because interest in smaller-bodied 12-fretters (where the neck joins the body at the 12th fret, rather than at the 14th) has been steadily on the increase in recent years; and secondly because travel guitars have gained serious credibility of late: just ask Ed Sheeran and his pint-sized Martin. Carefully slicing the tape on the outer carton, we can't help wondering if John Hornby Skewes & Co - proud fathers of the Vintage brand - have sent the wrong guitar: it's tiny. Stood next to a standard dreadnought, the tip of the peghead just about reaches the dread's first fret. "Stood next to a standard dreadnought, the tip of the peghead just about reaches the dread's first fret"
It's definitely no toy, though. The tinted solid Sitka spruce top is properly X-braced, the main struts carefully shaped away so the top isn't left too stiff given it small size. The laminated sapele back and sides are joined with proper kerfed lining, the neck block/join as good as we've seen on guitars costing multiples of this price. Sure, it's not the most fastidiously tidy internal job we've ever seen, but let's just remember this is a £229 travel guitar. Back on the outside, you get niceties such as maple binding around the top and back, and also the decorative 'rope' or 'half herringbone' border and soundhole marquetry: it's classily done and gives the guitar a distinct old-school, classic aesthetic. The dark-stained nato neck will divide opinion; a very pronounced V profile that gets ever more so the further you go up the neck. On the upside it gives some girth to what might otherwise have ended up as a broom handle, but if you like modern-feeling, rounded C profiles, this will take some getting used to. The V makes it feel chunky - actual measurements are 23.2mm at the first fret, rising to 27.5 at the ninth - so if you have shorter fingers and you grip the neck, you might find the V obtrusive. It's very much a matter of personal opinion. String spacing at the nut (36.1mm) and the bridge (54.5mm) are actually both a tiny smidge wider than the Guild D-55 dreadnought we have to hand for comparison, which comes as a surprise when you measure it, because the short scale and small body make everything feel compacted. Criticisms? At this price they're borderline negligible; only that the saddle edge is sharp under your picking hand. Five minutes with some wet and dry paper will have that sorted. Better news is that there's a factory-fitted second strap button in the 'correct' position in the heel: useful and welcome. Straight out of the box - absolutely bang in tune, it should be said - our Viator was tuned G to G and as such feels and sounds akin to a 'normal' acoustic capo'd at the third fret. You're instantly drawn in to picking open chords and the notes within them; Crowded House, The Eagles, Ed Sheeran, all kinds of country and the countless other artists whose sound involves a capo'd or high-strung guitar. "It's defined by its lively, springy midrange that projects well"
There's no deep, resonating bass, while trebles are soft; this guitar was never going to boom or sparkle like a long-scale instrument and it's important to say that it sounds very different from a good, full-size acoustic. It's defined by its lively, springy midrange that projects well and provides good accompaniment for other guitars and strings, because it sits in its own place. We'd also say it has a soupçon of Django/Hot Club jazz when you go at it with a plectrum. Down at standard E-E tuning, there a little too much elastic-band in the tone for our tastes, with not enough tension in the strings; tuning wavers if you're not precise and there's an almost nylon-string character to proceedings. It could be interesting when layered in recordings, of course. There are plenty of 'travel' guitars out there, not least since Ed Sheeran gave them serious modern credibility with his little Martin. The Viator is a unique take on the genre, adding a welcome helping of old-world charm and aesthetic to what might otherwise just be downsizing for the sake of it. In that respect, we'd say that Paul Brett and Vintage have their priorities right, worrying less about whether it'll fit into a suitcase, and more about coming up with an enjoyable, credible instrument. Fun is the main word, but if you're of a certain situation and need a few more, how about "I'm buying it for the kids to learn on"? Got to be worth a shot, surely?